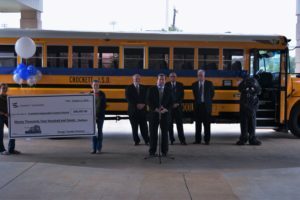 CROCKETT – In a ceremony held on Tuesday, Oct. 11, Energy Transfer Partners, L.P. (ETP) presented a check in the amount of $90,407 to the Crockett Independent School District for the purchase of a new school bus. 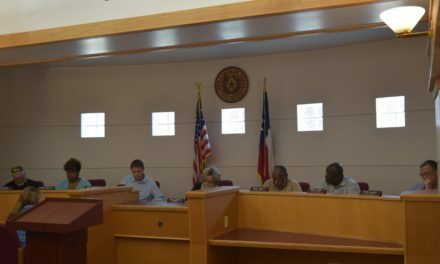 The festive occasion was attended by elected officials including CISD Board President Lela Wheeler and Board Member Roy Johnson, Houston County Judge Erin Ford and State Sen. Robert Nichols, along with a contingent of students, faculty and staff from CISD. 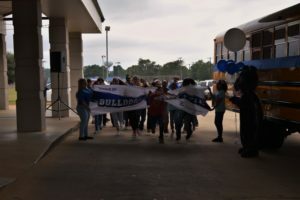 After a pack of Bulldog students ran through a celebratory sign, Grant Ruckel, vice president, government affairs for ETP opened the ceremony. “I want to thank you for the opportunity to be here today. It is our honor to present you with this check for the purchase of a new school bus. At ETP we believe fervently in the future of our children and the future of our communities. Some of the kids who are here today may grow up to become teachers, health care professionals and selfishly, I’m hoping some will grow up to be engineers so we can help build the energy systems of tomorrow. It all starts with a school bus ride in the morning and a safe ride home. 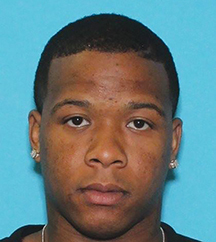 It is our honor and our pleasure to be a part of the Houston County and Crockett ISD communities,” he said. Once Ruckel concluded his opening remarks, CISD Superintendent Terry Myers addressed those in attendance. “We certainly want to thank ETP for being here. 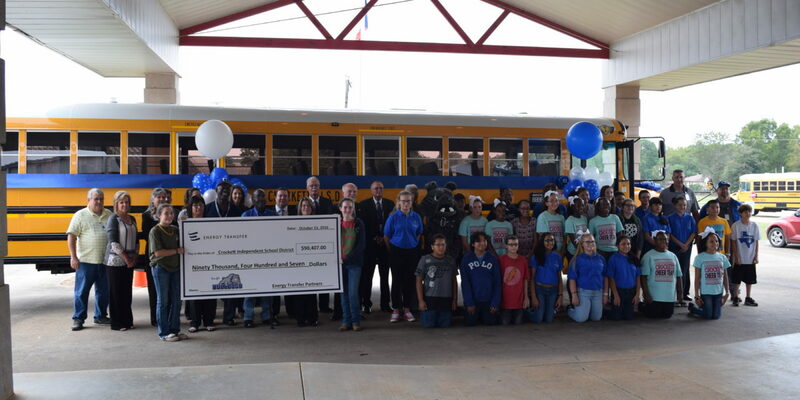 This is the first time in my career – I can tell you how rarely this happens – I have been a superintendent for 20 years and this is the first time I have seen a company step forward and donate a $90,000 school bus for the children of a community. We are very pleased to have a partner in education that has this type of commitment to our children. 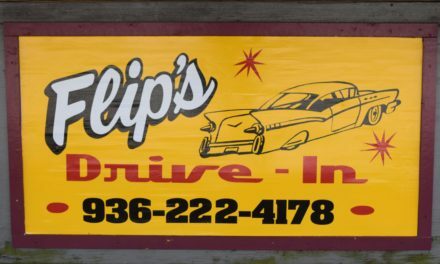 This is one of the inestimable values of Chapter 313 partnerships in the State of Texas. When businesse s commit to this kind of support for local school districts, taxpayers and our entire state benefit. 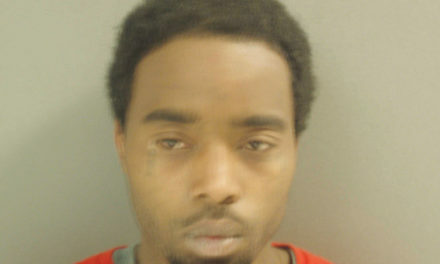 This is an overall win for everyone,” the superintendent said.